Airports are starting to offer "heart healthy" menu items. This new trend emerged after a pilot complained about fatty, artery-clogging foods at the Detroit Metropolitan Airport. Several of the restaurants there started offering good-for-you menu items, and now dozens of airport restauraunts around the country are following suit. These days, travellers are more interested in deli sandwiches and healthier options than burgers and fried foods. Perhaps this has something to do with the incredible shrinking airplane seats. Think you have to sit around and sulk while everyone else enjoys fun holiday treats this season? You don't! Dreyer's or Edy's (depending on which coast you live on) is offering two limited edition seasonal flavors of their Grand Light ice cream. Both the Eggnog and Peppermint flavors are low in fat and contain just 110 calories per serving. They'll be gone after December so start filling your freezers soon. More good news from the world of chocolate. Not only is it good for fighting heart attacks, but according to a recent study, chocolate can fight coughs as well. Theobromine, an ingredient found in cocoa, appears to be 1/3 more effective at stopping coughs than the current #1 cough-fighter, codeine. Need more chocolatey good news? Unlike codeine, theobromine doesn't cause drowsiness, so users may in fact operate heavy machinery while fighting coughs with cocoa. Yahoo! Rev up the tractor! We're getting veerrry close! Hungry Girl is fast approaching our 10,000th subscriber mark. In fact, we could get to 10,000 today or tomorrow. So keep spreading the word, because if our 10,000th subscriber signs up and puts your email address in the "How did you hear about Hungry Girl?" 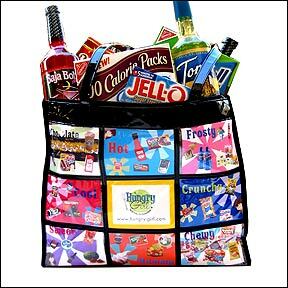 section, you'll each win this fun-tastic guilt-free snack-filled tote bag. Click "send to a friend" now for a chance to win! Today, November 29th, is National Chocolates Day. Try not to over-celebrate. Unless, of course, you have a bad cough. The new "Top Ate" is up! Click to check out our list if stress-relieving foods. Share this news with pals. Click "send to a friend" now!